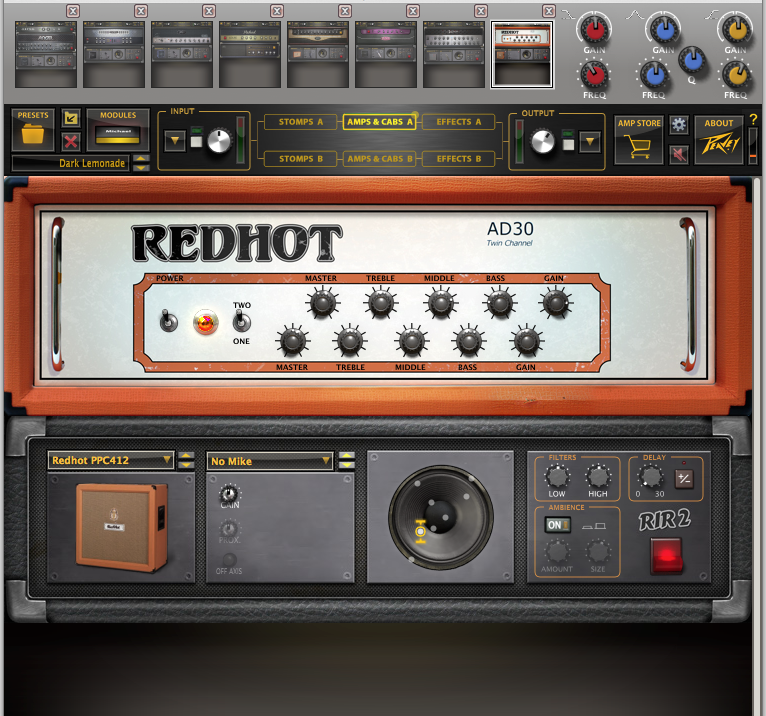 The most notable additions are ACT (Audio Cloning Technology), which provides guitar modeling, RIR 2, a new and powerful cabinet modeling section, and GIG mode for live performance. And, of course, you can still get all geeky and tweaky with the virtual components, if you’re so inclined. ReValver 4's main window. The RIR cabinet modeler is under the amp head. 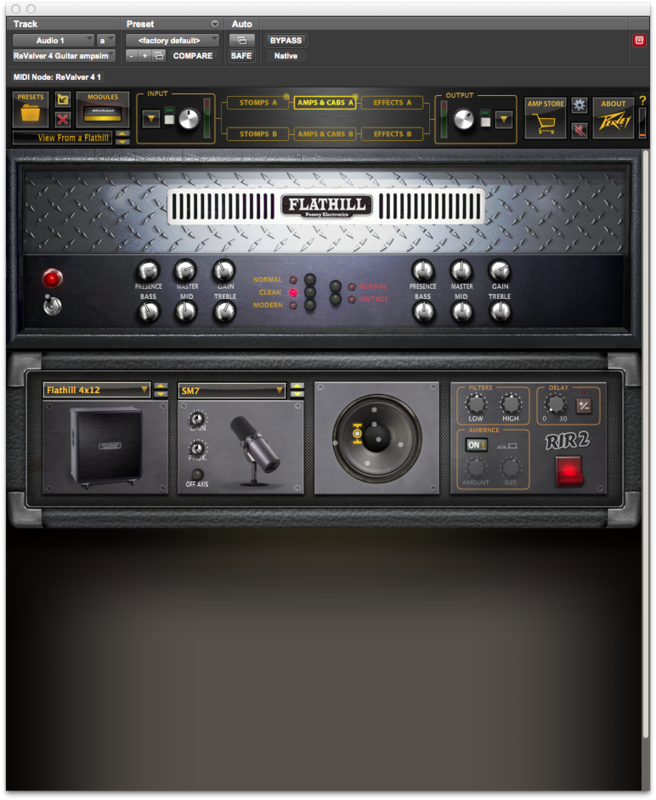 ReValver 4 uses the “freemium” approach made popular with iOS apps: The program itself is free, and comes with a small selection of amps and effects, with more available online at the Peavey Amp Store. You can buy them à la carte (ranging from $1.99 to $7.99 each, depending on the model type), or via the Producer Pack ($99.99), which contains the entire collection of amps, cabinets, effects and mic models. The flexible pricing scheme offers you a lot of flexibility to buy only the modules that you want. 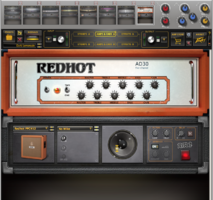 That being said, $99.99 is considerably less than many rival modeling apps cost (for example, IK Multimedia AmpliTube 3 and Native Instruments Guitar Rig 5 Pro are both $199), and you are probably going to want the full selection of components, so if you can swing it, get the Producer Pack. ReValver 3 owners can upgrade to the Producer Pack for $49.99. 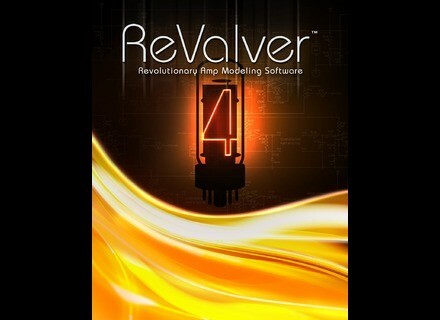 ReValver 4 runs both as a standalone application for Mac and PC, and as an AAX (64 or 32-bit), VST, or AU plug-in. It features a novel copy-protection system that asks that you insert a USB device (it could be a USB stick, audio interface, hard drive, or even an iLok), and ReValver makes note of the unique USB ID of the device, and uses it as a dongle. As long as that device is connected, ReValver 4 will be authorized. The manual is a little unclear about how this works, and frankly, until I contacted Peavey about it, I was not inclined to use my iLok, which would have been the most convenient, thinking that perhaps this authorization file written by ReValver could damage the iLok data. But it turns out that it doesn’t actually write to the disk, it simply references its unique USB hardware ID. My other concern about the copy protection was what would happen if the hardware device that I used for the authorization process failed. According to Peavey, “the ReValver support team can release the original USB device reference and the user can register a new device.” It’s actually a pretty good system, but the manual isn’t explanatory enough about the details. ReValver 4 can be opened as a mono or stereo instance, but, curiously, not as mono-to-stereo instance. If you want mono-to-stereo functionality, you have to use a stereo track, and while the sound you hear through the track’s output will be in stereo, you’ll only be recording to one side of the track. Considering that most modelers provide mono-to-stereo instances, not having it is a little inconvenient and seems an unnecessary hurdle. I spoke to Peavey about this, and was assured that mono-to-stereo functionality will be added in one of the regular updates in the near future. ReValver 4 allows you to setup two simultaneous amp and effects chains, which can be combined and then routed into ReValver 4’s Output Mixer. The amp model collection consists of 19 amps, at the time I’m writing this, and Peavey plans to add additional models regularly. If you buy the Producer Pack, you get a Fender, two Marshalls, two Buddah amps, a Vox, a Mesa/Boogie and an Orange amp, along with a whole bunch of Peaveys. I would have liked to see more Fender amp models (only one, a Bassman model called “Basic 100” is included), but overall you get a pretty wide selection of tones, which leans toward the crunchy and distorted. For the most part, the amp models are excellent, and, in combination with the new RIR 2 cabinet modeler, offer very realistic sound, touch and feel. Let’s look more closely at the RIR 2, because it’s one of the highlights of ReValver 4. A complete revamp of the previous RIR cabinet modeler, which is also included in ReValver 4, RIR 2 is both easy to use and fully featured. You get plenty of mic choices as you can see from the pulldown menu. First, you dial in a cabinet model (if you’re using one of ReValver 4’s presets, a matching cabinet is assigned automatically to go with the amp in the preset, but can be changed at will). If you have the Producer Pack, you get over 50 cabinet model options, although not actually from 50 different cabinets. Many are variations on the same cabinets but featuring open or closed back, or mic on bottom or top speaker, but the variety is still huge. You can also pick a virtual microphone, and, assuming you have the Producer Pack, choose from over 30 mic models, taken from 11 different mics. There are variations for different patterns, and whether the low or midcut switches are in. Based on the model numbers (no brand names are given), it’s obvious that the modeled mics include the Audio-Technica AT4047 and 4060, the AKG C414, Sennheiser MD421, Shure SM7, SM58, SM57, a Neumann U87, and even a Coles 4038 ribbon mic. The mic models really impact the sound, as does the mic placement, for which you have 12 different preset options. Plus, there are knobs for gain, proximity effect, and a button for turning the mic 45 degrees off axis. You can also add and tweak room ambience, dial in high and low filters, reverse the phase, and add delay compensation. The latter two are useful not only for correcting sonic issues in dual-cabinet setups, but for adding phase effects and adjusting stereo sounds. 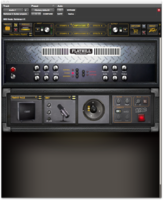 Effects wise, ReValver 4 offers a nice selection of stomp and rack effects, the former seemingly modeled from well-known pedals. The stomps include reverb, delay, echo, distortion, overdrive, chorus, flanger, phaser, compression, wah and even a “Whammy”-style pedal. Rack effects include a couple of multieffects units, World-Wide-Verb (delay, chorus and reverb) and Again Delay (ambience, chorus, delay), as well as a filter effect, graphic EQ, Audio Stream Splitter, and Kaften (a side chainable noise gate). Also included is the 3rd-Party Plug-In module, which allows you to insert AU or VST plug-ins into your ReValver 4 signal chain. This is a feature I’ve not seen in other modelers, and it’s quite handy. For the standalone version of ReValver 4, it’s particularly useful, because you can bring in other effects that otherwise couldn’t be integrated into your rig. On the plug-in side you could always add other effects before or after ReValver 4 in your insert slots, but being able to open outside effects within the plug-in gives you more flexibility. It also allows you to open up VST plug-ins in an AU or AAX host. I tried the other direction, opening up AU plug-ins in a VST host (Ableton Live 9 on the Mac), but it wasn’t successful. Overall, the effects options in ReValver 4 are plentiful, and of high quality. ReValver 4’s Input and Output Mixer sections offer a lot of processing and utilities on the front and back end, respectively, of your signal chain. Both are designed to look like 500-series racks, which is cool from an eye-candy standpoint. On the left of the Input Mixer is a module called VU Meters, which lets you adjust and fine-tune the input to match your guitar. Pressing the Auto button normalizes the input level to -0.3 dB for your guitar. 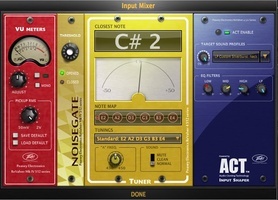 The Input Mixer offers a number of useful utilities, as well as access to the ACT Input Shaper. Underneath it is a knob called Pickup RMS, which can be set to match (from -50mV to 2V) the output of your pickups. The manual, again, is unclear about how to use this, and that it’s not really necessary to adjust. If you auto-normalize the input you’ll be fine. If you want, you could look online to try to find the exact output level of the pickups on your guitar and set the Pickup RMS to match exactly. Like with the ability to tweak other components, ReValver 4 lets you go as deep as you want, but never forces you to dive deep if you don’t want to. 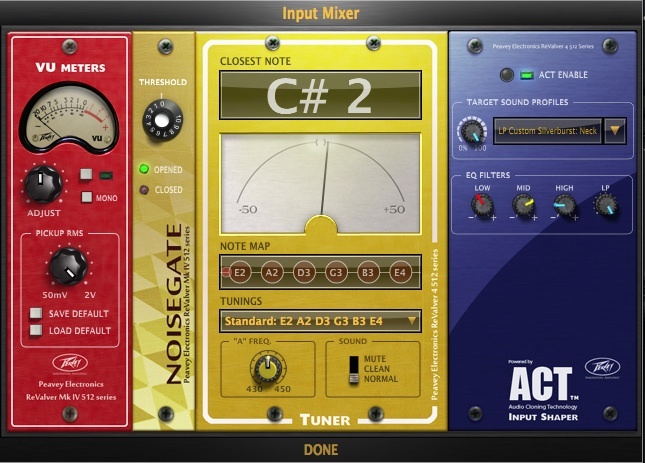 The Input Mixer also includes a simple but effective noise gate; a tuner; and the ACT Input Shaper, which is basically a guitar-modeling section that imbues the signal from your guitar with the sonic characteristics of a variety of electrics, acoustics, and even a metal-body resonator. It works like this: You select a Target Sound Profile from a dropdown menu in the Input Shaper, which, at the time of this writing includes 22 different instruments, each with multiple options that cover different pickups for the electric guitars, and different mic combinations for the acoustic instruments. Pressing the red button opens the “recording tool,” which asks you to strum on your guitar for about 10 seconds, while it profiles it. If you’ve already recorded your guitar part, you can play the track into the profiler instead. After the profile has been captured, the Input Shaper applies the the modeled instrument to your guitar sound. On the front of the Input Shaper is a Blend knob, that lets you control the ratio of modeled to non-modeled guitar sound, and several EQ Filter knobs for further adjusting the tone. These are quite useful, as some of the models are fairly heavy in the lower-midrange area, and in those cases, being able to cut those frequencies helps a lot. So how does the Input Shaper sound? Mainly quite good. There are a couple of Les Paul models included (called "LP Std," "LP Custom Silverburst" ), and since I play an ESP 400-series Strat, I thought it would be cool to apply the humbucker tone of the Les Paul to the single-coil sound of my guitar. The result was a fatter, beefier more Gibson-like tone. In this example, recorded through the 6505 amp model, there's no modeling the first time through, but when it repeats, the LP Std guitar model is on. I also applied a Telecaster sound, and that gave me the brighter, edgier flavor of a Tele. In this example, my ESP Strat is going through ReValver 4's Angel PBII amp model with a clean setting. The first time though there's no guitar modeling, and the second time through the T-Caster model is applied. Once you’ve profiled your guitar, you can switch between different models within the Input mixer without the need to re-do the profiling. The process is a little clunky, because you have to open up the Input Shaper dropdown menu again, find the new model you want, select it, and then close the dropdown in order to hear the new model with whatever amp/effects/cabinet settings are active. If you remove ReValver from the Insert slot in your DAW, or quit out of plug-in or standalone version, it won’t remember your guitar’s sonic profile, so you’ll have to profile it again (about a 10-second process) the next time. ACT also disengages when you change presets, which is inconvenient when trying to select both amp/cab/effect and modeled guitar sounds. 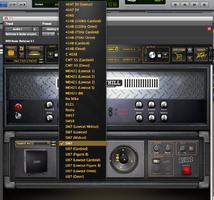 The introduction of guitar modeling in ReValver 4 is both innovative and useful, giving you a lot more sonic options. It also represents a major shot across the bow of rival modeling applications on the market. But there’s more than just modeling on the input side. After the amp, effects and cabinet models, the signal passes through ReValver 4’s Output Mixer. Like the Input Mixer, it’s got a 500-series look, and consists of five modules: The first, called Multiple Chains, is designed for blending and panning when you’re using a two-rig setup. 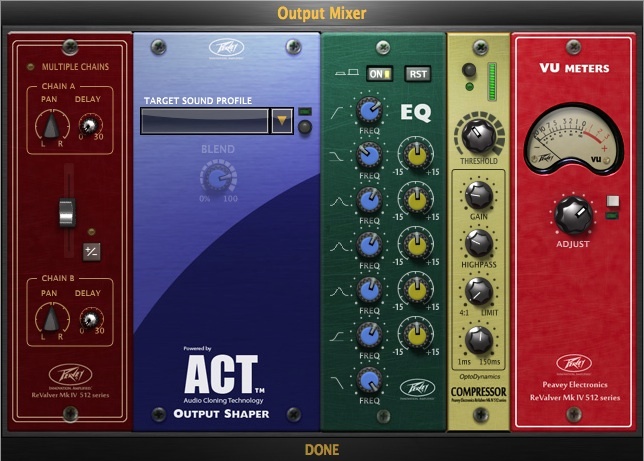 Next is the Output Shaper, which applies a different set of ACT profiles to your sound, offering a variety of different EQ selections. Again, you need to play your guitar (or the guitar on your recorded track) into the module so it can come up with a profile, and then the processing is applied. The Output Shaper profiles are broken up into categories: Clean, Crunch, Dist, Heavy, Post-Rock Metal and Teasers. The profiles in the Output Shaper are, according to Peavey, “usually a guitar through an amp, recorded with a mic, maybe with post processing." So basically, it gives you options for additional sound shaping, and the profiles definitely have a big impact when you apply them. Here's an example, recorded though a model of a Peavey Classic 30 amp. It repeats: the first time with no Output model, and the second time with the Clean Drive model applied. 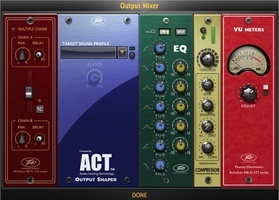 The Output Mixer comes after all the amps, cabinets and effects in the signal chain. My only problem with the Output Shaper is that many of the profile names are not particularly descriptive (for example, “I’ve Got a Cold” and “Rubber Strings,”), so you have to spend time auditioning them to know what they’ll sound like. Rather than the cute preset names, more technical descriptions — ones that say what guitars, amps, and mics were used in each one — would be helpful. Rounding out the Output Mixer is a 7-band EQ with 5 semi-parametric bands, a compressor and the final VU Meter module that lets you check and adjust your output levels, and, like the input, has an auto-normalize option. Another addition that arrived in ReValver 4 is GIG mode, which is designed to make it easy to use ReValver 4 for live performance. You can only access it through the standalone version. Selecting GIG mode from the File menu opens up an alternate version of the main GUI, featuring 8 empty slots. Clicking on a slot opens up the preset menu and lets you choose an amp/cabinet combination to fill it. Switching between sounds is as easy as clicking on a slot. The slots also respond to MIDI program change numbers 1 through 8, so you could use an external switcher or buttons on a controller to change. On the far right of the GIG mode controls is an EQ section. It features two semi-parametric bands— high frequencies and low frequencies — and a fully parametric midrange band. These are global EQ controls, affecting any of the eight presets loaded. You can save and load sets of eight so that you can have different preset groups for different gigs different sets or whatever. At the top of the image are the GIG mode preset slots and EQ. GIG mode is a nice addition. My one big problem with it is that, unlike other music software with live-performance modes, ReValver 4’s GIG mode doesn’t offer a simplified, large-sized display, designed to be visible from a distance. When you’re onstage, you want to be able to easily see your settings, not have to walk over to your laptop and peer into the screen from close range. Hopefully, Peavey will reconsider the layout of the GIG mode GUI. As it currently exists, the GIG mode controls are all located in a small strip across the top, and the regular amp/cabinet display is below it, just like in normal mode. If I were designing it, I’d make the preset slots a lot bigger and easy to see, filling up most of the window with a space for the amp controls of the active amp at the bottom of the screen. I’d hide the cabinet controls, making them only available by pressing a button. You’re much more likely to want to adjust the amp controls in a live situation than to start messing with cabinet parameters. 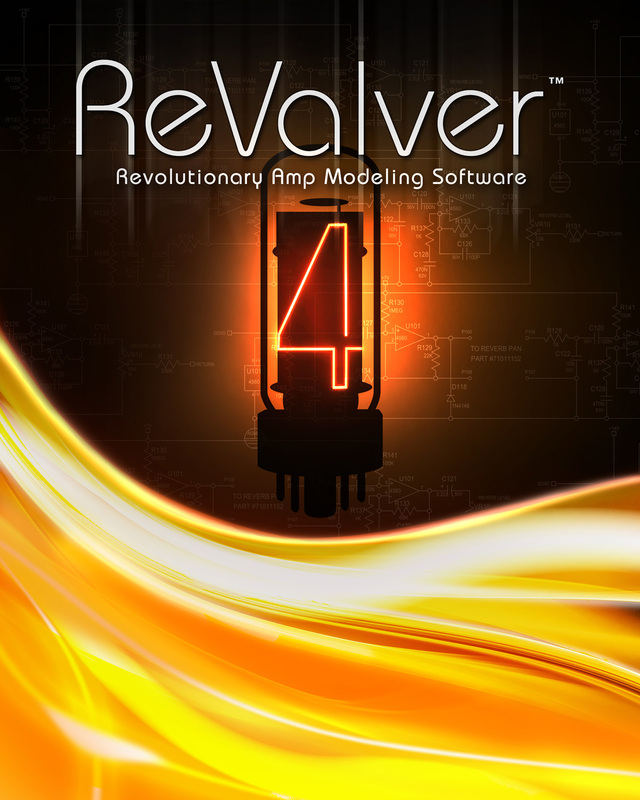 ReValver 4 is a significant new version, thanks to innovative features such as ACT, as well as the flexible new RIR 2 module. It might not have quite as comprehensive a model collection as some of its competitors (although it still offers a pretty large set), but its models mostly sound excellent, and offer a realistic amp feel. Considering that the program is free and the Producer Pack just $99, it’s by far the best deal in modeling software around. And of course, if you love tweaking the internal components, ReValver is a veritable playground. Overall, I’m quite impressed. 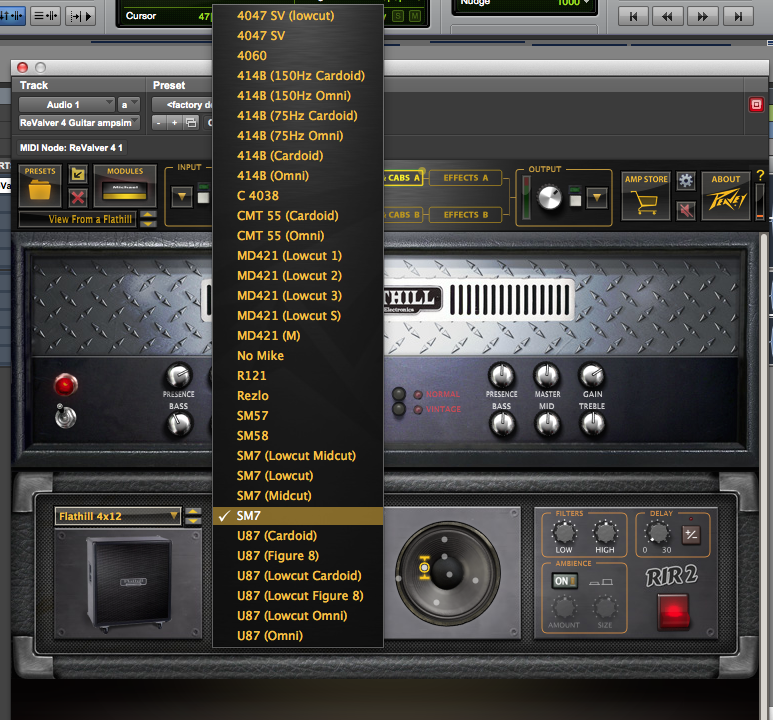 Kudos to Peavey for putting out such an innovative piece of software.